Polio Hides Out In A Few 'Sanctuaries' In Nigeria : Shots - Health News Despite intensified efforts to vaccinate kids in Nigeria, polio cases are on the rise there. It's one of the last places in the world where polio is endemic. Most cases are popping up in a few communities that are now the prime targets for public health workers. 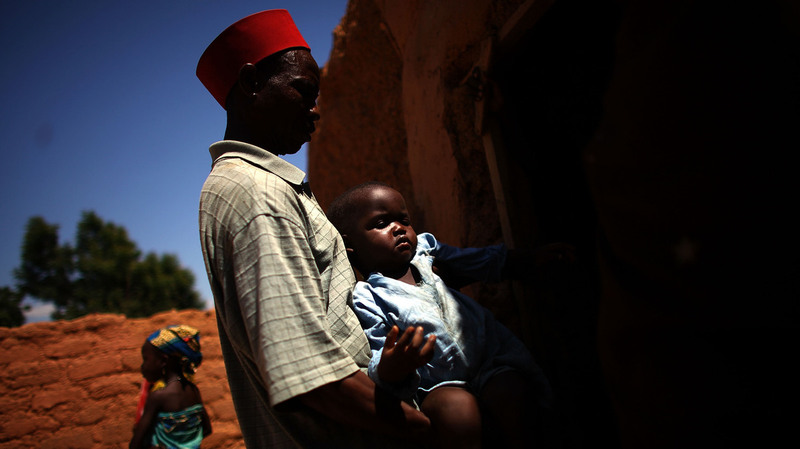 Ado Ibrahim carries his son Aminu through a village in northern Nigeria. Aminu, 4, was paralyzed by polio in August. Nigeria is the world's epicenter for polio. It's the only place where cases are ticking up, and it's been the source of outbreaks in other countries since 2003. There was a disappointing update from public health officials Thursday about the polio situation in Nigeria. Despite beefed-up efforts to vaccinate kids and a flood of new resources, Nigeria still hasn't turned the corner on polio. There have been twice as many polio cases as last year, and a few communities, where kids chronically miss vaccines, are serving as "sanctuaries" for the poliovirus, giving it a place to replicate and survive. At the same time, monitoring polio's spread and transmission has been lackluster. The update, published in the latest issue of Morbidity and Mortality Weekly Report, does have a few nuggets of hope in it. More kids have been vaccinated this year compared to 2011, and health workers are now using modern satellite tools to track vaccinators and target kids who often get overlooked. Polio in Nigeria has been on a roller coaster ride. As in Pakistan, Muslim leaders first opposed the vaccine, but then started supporting it. The number of polio cases plummeted from over 700 in 2008 to 21 in 2010. But since then, the virus has rebounded, and Nigeria has already reported 99 new cases so far this year. Most infections occurred in only a few geographic locations, and these last pockets of polio pose "a major obstacle to achieving global eradication," the authors write in MMWR. If the virus isn't stopped in these communities by the middle of next year, the authors call for "additional innovative vaccination strategies to interrupt all WPV (Wild Polio Virus) transmission" in Nigeria.